Black-Box security assessment: check if SSL client has been implemented in a right way. S2 – not an attack, but still incorrect implementation: The site or adversary presents an expired certificate. S3: The site or adversary presents a certificate with a wrong Common Name (CN) and/or SubjectAltName, signed by a root CA. Now open the application in test (let’s imagine it is a PayPal client for Android), get it to use Fiddler as a proxy and try to run it. If it works (highly improbable in our days), then SSL chain of trust is broken and the client does not check whether the certificate is signed by a trusted Certificate Authority. S2 - Expired certificates case is slightly trickier. Probably the simplest thing to do would be to use the app so that Fiddler creates the certificate, then, without closing the app, change the local system clock to three years in the future. in the QuickExec box so that the certificates generated expire nearly a year before the current date. Make sure that our PayPal client does not work either! To do that, open Fiddler. Click Rules > Customize Rules. Scroll to OnBeforeRequest. Save the file and restart the client if it had previously established any connections to https:// paypal.com. Take a look how unhappy the browser is! Now open the testing applications and see how it would behave! If the application successfully passed these simple checks, rest safe and assured: only Kazakhstan government is able to sniff your traffic! Java Null Byte Injection is surprisingly overlooked by community. There are solid reasons for that: after all, Java does not use null byte as the End Of String symbol. However, Java IO libraries hand off strings to the underlying OS, which in most cases uses ‘C’ engine for final processing. And the ‘C’ processor always rejects anything beyond the null byte character. If we manage to assign to the dirVariable wickedly crafted string with null Byte inside it, everything that goes after the null byte will go straight to nowhere, and the first part will be used to open a file we want. Now Java will calculate PathVariable as "/etc/passwd\0x00/application.log". But FileReader – viola - will open "/etc/passw” file. Another interesting point is how to pass null byte to Java using HTTP protocol. So, dir in our example should be "/etc/passw%00", where '%00' is a URL-encoded null byte. This is a notification that you have multiple apps, listed below, built on a version of Apache Cordova that contains security vulnerabilities. This includes a high severity cross-application scripting (XAS) vulnerability. Under certain circumstances, vulnerable apps could be remotely exploited to steal sensitive information, such as user login credentials. Please note, applications with vulnerabilities that expose users to risk of compromise may be considered “dangerous products” and subject to removal from Google Play. Sure, after such a note from Big G, programmers, which use Apache Cordova (aka PhoneGap), are in a desperate need of upgrade to Cordova 3.5.1 or higher. For some, it might be a problem, as requires a lot of retesting. Is there other way to mitigate or eliminate the problem? Let’s take a closer look on the issue. While all the vulnerabilities are dangerous and entertaining for every hackers or security analyst, it is CVE-2014-3500, which needs to be taken care of ASAP. The WebView object, provided by the Android Framework allows developers to embed a browser within their own apps. This functionality is great for developing portable apps and is the basis of Apache Cordova. The loaded web page of the WebView object is controlled by the WebView.loadUrl() API. Just meditate here a little. As the url parameter is taken from getIntent().getExtras(), it can be provided externally. This presents a vulnerability which can be exploited whereby a malicious caller could launch the Activity with an Intent bundle that includes a url provided by the caller. The provided URL will then be loaded by Cordova and rendered in the WebView! To fix it, find every exported Activity, that call WebView.loadUrl() API. Locate the place where the Activity is instantiated and clean ‘url’ and ‘errorUrl’, provided by a caller. I skipped the part on errorUrl, but you can find it in the IBM paper, they are very similar. Now you application is not vulnerable to CVE-2014-3500, and you won time to update to the latest Cordova version. Developing your own application or making a security assessment of 3rd party application – it is very important to know, what traffic flows from an Android application? There are several ways to do it. We may use different proxies, we may utilize a real device or an emulator, and we might intercept air traffic or direct it through USB cable. It is often that we need to intercept and analyze traffic from a real device and want to use Wi-Fi for that. Here is how we may do that using Fiddler. For this method to work you need a rooted Android device and an infrastructure which allows you to perform socket connections from your phone to your PC – Wi-Fi connection and an ordinary laptop with Wi-Fi module with would do just fine. Download the free version of Fiddler from Telerik. 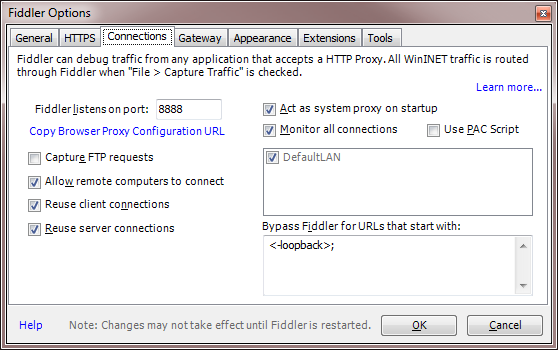 When running it the first time, make sure you allow Fiddler to accept network connections from the intra- or internet, depending on your infrastructure setup. Hit OK and restart Fiddler. Download Proxy Droid to your Android phone. Run it and configure it to point at your Fiddler instance by entering the IP of your computer and its port (8888 by default). Note that you must use the local IP address (often starting with 192.168. * or 10.*). Usually the device eth0 will have the IP address you need. Simply start your favorite Android browser and navigate to a random web page. You should get the page presented normally in the browser, and see the HTTP requests line up in Fiddler. All apps will use this proxy now – not only the web browser. Whether you’re using this for policing other apps, or for debugging your own applications or 3rd party APIs, this is a technique that should be in every Android developer’s toolbox. And what if the traffic from the targeted Android Applicaion is SSL encrypted? It might be a very serious problem, if it uses its own SSL infrastructure (i.e. SSL pinning). However, it might also be an issue with Android HttpsUrlConnection pipeline implementation - and Fiddler, happily, may fix it! There are plenty of tutorials on how you can intercept HTTP(s) traffic from Android using Fiddler. However, it will fail when you try to intercept and decrypt Android SSL traffic coming from an application, and not from a browser. It might be that the application uses a certificate pinning – and you are probably cannot decipher this connection. Lost cause! But more probably, the reason is a bug in the HttpsUrlConnection pipeline implementation. 4 Save the file and restart Fiddler. Sometimes it is necessary to integrate PHP code into existing rails application. Using open source and time-tested PHPBB3 is a good example. To do that, simply disable Passenger for the directory of your PHP application. WEBrick is so slow! why? WEBrick is doing a reverse DNS lookup on connecting IPs by default. In other words, it's trying to see if your IP address is associated with a domain name. This is unnecessary and takes too long, so you can disable it. Open the file "l/ruby/lib/ruby/1.9.1/webrick/config.rb" and locate the line with ":DoNotReverseLookup => nil".